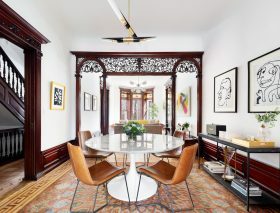 Image courtesy of Bedford Stuyvesant Restoration Corporation. 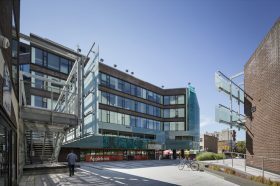 Restoration Plaza, the commercial complex on Fulton Street in Bed-Stuy that has served as a neighborhood hub since it opened in 1972, is getting a major revamp, with British starchitect David Adjaye at the helm for its design. Curbed reports that the nonprofit Bedford Stuyvesant Restoration Corporation, which owns and operates the plaza, has announced the creation of a five-year plan for re-imagining the site, including improved services for the surrounding neighborhood and the addition of 400,000 square feet of office space to the complex that currently houses the Billie Holiday Theatre, office space, restaurants, grocery stores and the Brooklyn Business Center. 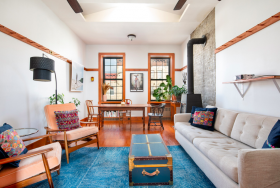 A condo full of Shaker woodwork detail in Brooklyn’s Bed-Stuy neighborhood has hit the market for $799,000. 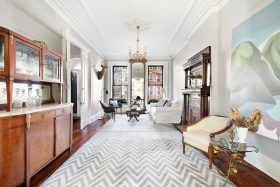 The two-bedroom, two bath home at 464 Hancock Street boasts 10-foot-high ceilings, a functioning wood stove, and an envy-inducing windowed clawfoot tub. The sunlight-drenched home also features Shaker woodwork peg racks in most of the rooms and along the hallways, making for a unique storage addition. 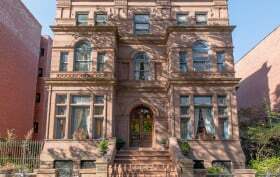 Available from January through August of 2019 at $5,250 per month, this freshly-renovated brownstone triplex at 458 Hancock Street in Bed-Stuy‘s coveted Stuyvesant Heights historic district presents a great opportunity to get to know the city and the neighborhood. Interiors are bright and spacious, and you don’t need to bring anything but your family or friends, and your toothbrush. The four-bedroom home with lots of space to spare plus a private deck and yard comes ready for living, complete with cool furniture and plants. 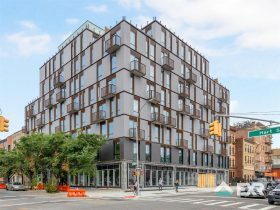 A new rental building just a few blocks from the Myrtle-Willoughby Avenue G train stop in Bed-Stuy is opening an affordable housing lottery for 20 apartments. 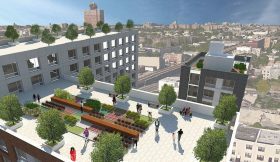 Conveniently, the 65-unit building at 633 Marcy Avenue will have a supermarket in its base, as well as a laundry room, gym and yoga room, kids room, and a landscaped roof terrace. 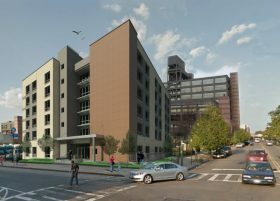 The affordable units are open to households earning 80 or 130 percent of the area median income. Those on the lower end range from $1,102/month one-bedrooms to $1,327/month two-bedrooms. On the other end, however, the savings are minimal, as they range from $2,207 one/bedrooms to $2,665 two/bedrooms. Currently, the market-rate two bedrooms are going for $2,800/month. 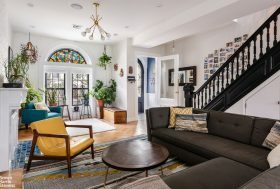 Located in the Stuyvesant Heights section of “arguably the most beautiful block in Bedford Stuyvesant,” according to the listing, this charming duplex has a ton of hidden magic for under $1 million. 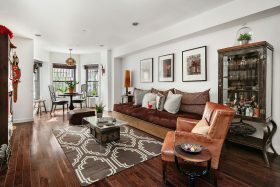 The one-bedroom-plus-den condo occupies the garden and lower levels in a brownstone at 579 Jefferson Avenue and boasts a lovely backyard complete with a patio, fire pit, and rustic wooden walls. Inside, more architectural and decorative surprises await.